With EU beer production rising above 40 billion litres for the first time since the economic crisis, The Brewers of Europe confirm that the growth trend continues for the EU beer sector at the 7th Beer Serves Europe event. A successful mix of world-leading multinationals, deeply-rooted regional breweries, and thriving SMEs, Europe’s breweries support the delivery of Europe’s 2020 Growth Strategy and contribute significantly to trade with the rest of the world. Addressing the Annual General Assembly of The Brewers of Europe following Beer Serves Europe VII, Vice-President of the European Commission Jyrki Katainen commented on the competitiveness, innovation and investment in the European Brewing sector and its contribution to job creation and trade. 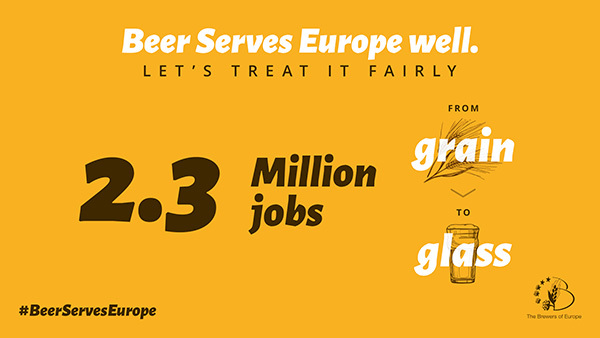 “Just the number of jobs created by beer in Europe – 2.3 million jobs at the last time of counting – is a testament to how beer can help create growth and prosperity in Europe as a whole”, said Pavlos Photiades, President of The Brewers of Europe. Dimiter Tzantchev, Bulgarian Ambassador to the EU said “European brewers are a valuable stakeholder in the promotion of high technological, environmental, social and health standards in society". He also highlighted the brewers’ commitments to marketing self-regulation, public awareness campaigns against drink-driving and the provision of consumer information. Small business has always been big in brewing, but today more and more start-ups are combining local traditions with innovation. 20 micro-breweries open every week in Europe. 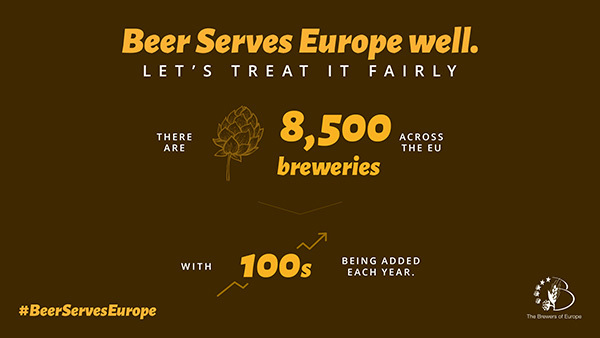 There are now 8,500 breweries across the EU. 1,000 were launched in the past year alone. 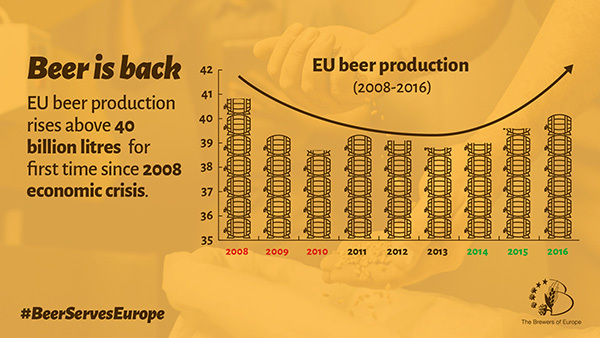 EU beer production is back above 40 billion litres for the first time since the economic crisis, with three years of consecutive growth. Germany, Poland, Spain and the United Kingdom are the largest producers of beer in the EU. Supportive policies enable brewers to continue contributing to the overall competitiveness of the European economy and sustained growth. EU beer brands are extremely popular and fast-selling across the globe. 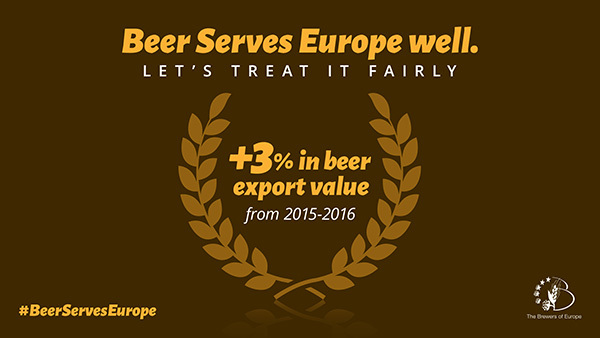 Out of the top ten agri-food export sectors, beer is one of Europe’s fastest growing in trade value terms. 8.6 billion litres of beer brewed within the EU is exported abroad. Exports represent one fifth of EU beer production, one third of which leaves the EU. The top three countries for Europe’s brewers are the US, China and Canada, but over the past twenty years Europe’s brewers have extended beer trade to 123 countries around the world. Beer exports were particularly important from Belgium, Germany and the Netherlands in 2016. With thousands of years of prestige and a bubbly future in innovation and diversity, beer is a vital European business. Europe’s brewers call for a sustainable tax regime that recognises beer's positive impact throughout the value chain, from grain to glass. Beer adds €50bn, annually to EU output and over €42bn in tax revenues for governments. Notes to editors: The 2017 edition of Beer Statistics was compiled from data collated by national brewers’ associations through surveys carried out by The Brewers of Europe and Eurostat. Historical analysis is supported by information in The Contribution made by Beer to the European Economy, a report commissioned by The Brewers of Europe and conducted by Europe Economics, released in February 2016. About us: Based in Brussels, The Brewers of Europe brings together national brewers’ associations from 29 European countries and provides a voice to support the united interests of Europe’s 8,500 breweries. The Brewers of Europe promotes the positive role played by beer and the brewing sector in Europe and advocates the creation of the right conditions to allow brewers to continue to freely, cost-effectively and responsibly brew and market beer across Europe. Follow us on Twitter and visit our website.